The National Union of Healthcare Workers is a worker-led movement dedicated to improving the lives of caregivers and patients. NUHW was founded in 2009 as a democratic alternative to healthcare unions that have adopted top-down corporate power structures that deny members a voice in their own union. 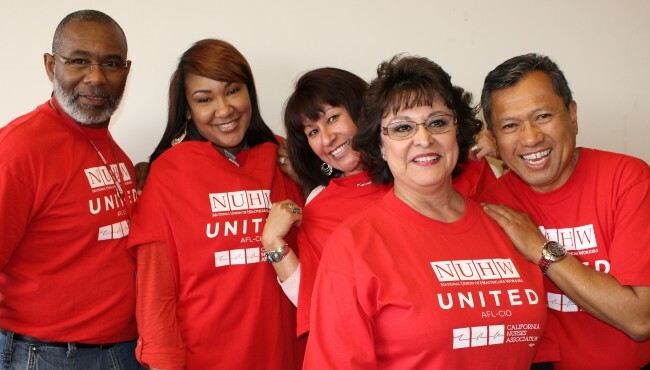 At NUHW, workers set the agenda, lead bargaining talks, and elect their own leaders. And we never make agreements with employers without member approval. Our worker-based movement has enjoyed great success. NUHW is the nation’s fastest-growing healthcare union with approximately 15,000 members. We have fought off takeaways accepted by other unions, won massive raises for new members, and forced Kaiser Permanente, the nation’s largest health maintenance organization, to start improving the mental health services it provides to hundreds of thousands of patients. A strong union is led by its members. Worker power is the foundation of a just society. Quality patient care requires that caregivers have a voice in their workplaces and are protected from retaliation. Our members include service and technical workers, nursing assistants, registered and licensed vocational nurses, mental health clinicians, clerical workers, and many others whose hospitals and clinics rely on them to provide top quality care and service. Working together, we are committed to expanding health care access, improving patient care, and defending the right of all workers to earn good wages and benefits and feel secure in their jobs.